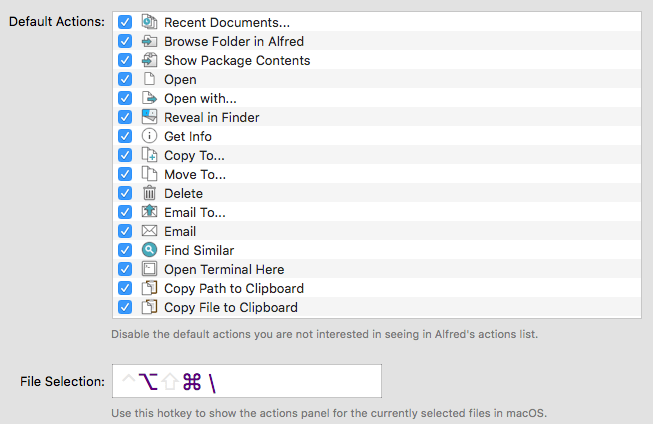 When you find a file in Alfred or in Finder, it's easy to take action on it; Email it, copy it, reveal it in Finder, or even create your own custom action. You'll need a Powerpack license to take advantage of the File Actions feature. Discover all the amazing things you can do with the Powerpack. The File Actions panel will appear, where you can quickly choose the action you'd like to perform on your file or files. Hit Return and you're done! Alfred will show the relevant actions, ensuring you only see actions that can be used on the file type(s) you've selected. You can see the full list of default actions in the preferences under Features > File Search > Actions. Need to take action on multiple files at once? No problem! 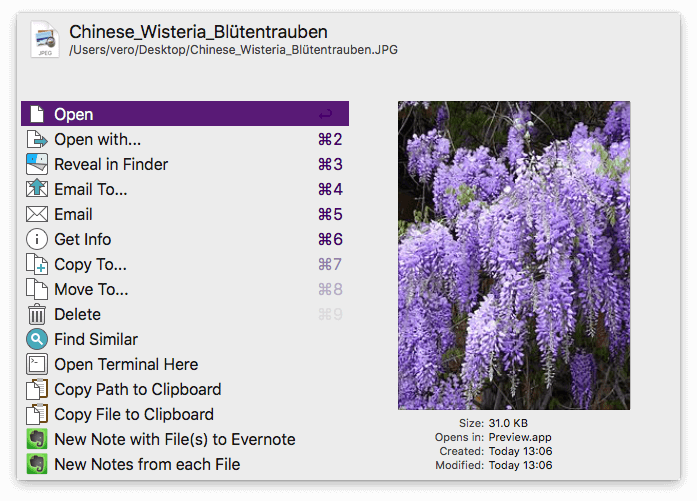 In Finder, simply select the files and use the Cmd + Alt + \ hotkey to see the actions relevant to those file types. In Alfred, use the File Buffer feature to add files to your buffer with Alt + up arrow. Once you see all the files you need nestled at the top of your Alfred window, use Alt + right arrow to see the actions available for these files. You may have noticed in the screenshot at the top that there are a few actions that aren't defaults; The two Evernote actions, in this case. These are created using Alfred's incredibly flexible workflows, which give you a way to create actions specific to your needs. Custom file actions can be as simple as moving a file to a fixed location (e.g. your Dropbox folder) or can use a script to perform an action; saving the file to Evernote, in this example. To do this, your workflow will need to include a File Action trigger object, which lets Alfred know that you want this action to be available in the list of File Actions for relevant file types. As with every workflow object, you can learn about File Action Triggers on our help site.